Sweet family reunions make up for strained shots at redemption as Outlander Season 4 enters the final stretch. How do you make amends for a bad decision? 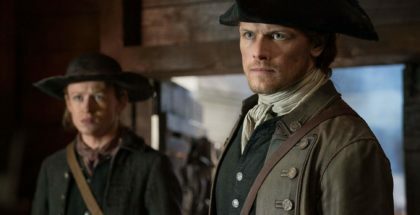 That’s the overriding question as Outlander’s fourth season nears its final chapters – both for the writers and characters. The writers are the ones with the biggest challenge, after they fudged the will-they-will-they romance between Brianna and Roger, first by having her apparently change her mind entirely and happily agree to his all-or-nothing demand of marriage, and second, by her subsequently being raped by Stephen Bonnet (after her and Roger then had an argument and split up again) – which either came across as a strange form of punishment for her behaviour, or as a way to make Roger seem nicer by comparison. 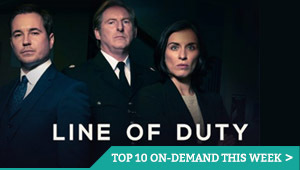 Episode 9 appears to double down on the latter logic, as Jamie finds Roger and, mistaking him for Stephen, beats him to within an inch of his life. And that’s the big mistake that Jamie then spends the ensuing two episodes trying to make amends for. But first, let’s talk about something happier: Brianna meeting her parents. Sam Heughan and Caitriona Balfe remain the best thing about Outlander, and if your heart was warmed by them as a married couple, wait until you see them as parents. Jamie is spied by Brianna in the street, as he’s taking a leak in the corner, and their untimely encounter is turned by Heughan into a moment of amusing awkwardness and delightful heart. He smatters her with a string of Scottish words for “blessing” and “darling” “daughter” and we’ll stop now before we melt into a puddle. 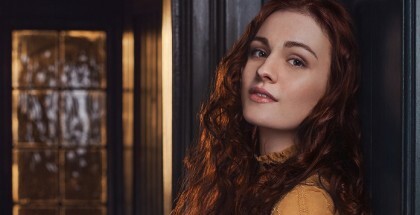 Cutest of all is that he’s only more excited by the thought of taking Brianna to see Claire again – and, again, Balfe’s caring presence sells the reunion with aplomb. But Jamie makes a major error when Roger arrives at Fraser’s Ridge, and Lizzie – who saw Brianna and him in the street, before seeing her again, later, after she was raped by the unseen Stephen – thinks that he’s the one responsible for what happened. And so she tells Jamie, just as Claire finds her ring and realises it was Bonnet. She doesn’t tell Jamie, though, and so he punches Roger’s face to a pulp, then asks Cousin Ian to get rid of him. 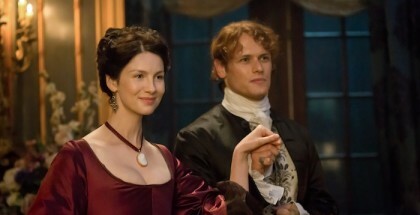 With all of them departing Fraser’s Ridge – and staying out of the plot for most of the following episode – Murtagh descends to shepherd Brianna and the mildly useless Lizzie to somewhere safer: yes, it’s time to go back to the plantation owned by Aunt Jocasta, where Brianna’s modern views are sure to go down a treat. To smooth over that transition, Murtagh turns on the charm, and the chance to see he and Jocasta exchanging flirtatious pleasantries is enough to give us a new second favourite couple to stan. Murcasta, anyone? Jocasta, meanwhile, is busy trying to come up with her own relationship to root for, and she invited all the eligible bachelors in the area for dinner, so they can meet Brianna and, she hopes, propose to her. Brianna: not amused. And so we have the fun of seeing her weave through the snake pit, from the slimy, obsequious Lietenant Wolff (“I have newfound empathy for your great aunt’s lack of sight,” he enthuses, when they her of Brianna’s empowering views of Jocasta’s slaves) to the mildly creepy Gerald Forbes, who repeatedly asks her to take a stroll in private to discuss every single subject that comes up in conversation. Enter, though, a knight in shining armour: none other than Lord John, who has apparently been asked by Jamie to check in on Brianna and make sure she’s OK. If you’ve ever been dubious of Lord John’s intentions, their resulting conversation is enough to turn you into his biggest fan. He talks of her dad in fond words that make it clear his love for him ain’t going anywhere, and then listens sympathetically to her recounting the assault and her situation. He’s kind and considerate, even after she discovers him making the beast with two backs in Jocasta’s corridor that night with Judge Alderdyce (the other member of Outlander’s take on First Dates). Brianna, as canny as her mother, moves quickly, blackmailing him into marrying her, keeping his sexuality a secret and keeping her out of Gerald Forbes’ clutches. Murtagh, meanwhile, finds himself in a spot of bother, after he finds Stephen Bonnet with assistance from Fergus. Dragging him, unconscious, through an alley, they find themselves stopped by guards, and so Murtagh punches Fergus to make him look innocent – leaving him alone in the street, and Murtagh and Bonnet arrested, after Murtagh points out the identity of the slumped body. And what of Roger? While all this is going on, Roger briefly escapes from his captivity and randomly finds himself in front of some more standing stones, debating whether to go back to his own time. Naturally, he doesn’t, and gets swiftly recaptured – the fact that this is a cliffhanger, and is totally devoid of tension, only highlights how hard the show is trying (not entirely successfully) to make us feel sympathetic for him. 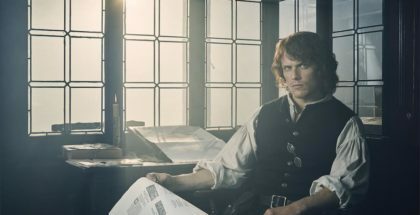 Indeed, as Jamie wrings his hands with guilt on the way to New York, where Roger will be, it’s telling that we’re less concerned about his and Brianna’s reunion as we are looking forward to Jamie and Claire’s face, when they return to Jocasta and find Lord John engaged to their daughter. Season 4 of Outlander is available on Amazon Prime Video, as part of £5.99 monthly subscription.